Orbital ATK moved an updated version of the Antares rocket to Virginia Space’s Mid-Atlantic Regional Spaceport launch pad Thursday in preparation for the rocket’s first hot-fire engine test, Universe Today reported Monday. “After the 30 second test is done we will shut it down and have a pile of data to look at,” Eberly said. Orbital ATK plans to use the Antares 230 rocket to launch the Cygnus spacecraft to deliver cargo to the International Space Station as early as July, Kremer reports. The company used two Russian-built RD-181 engines to update the launch vehicle, according to the report. 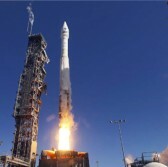 Orbital ATK’s Cygnus launched into space in December 2015 and March through the United Launch Alliance-built Atlas V rocket to perform cargo resupply missions to the ISS.